Amelia Island Lighthouse is the oldest existing Lighthouse in Florida and the only one from the Territorial Period that has survived without major rebuilding. The Lighthouse was built in 1838 using materials from the former lighthouse on Cumberland Island in Georgia, just across the inlet. The brick tower was originally placed on a hill and was 50 feet tall. In 1881 a lantern was installed on the tower and increased the height to 64 feet with a focal plane of 107 feet. The light source for the original lighthouse was fourteen lamps, backed by reflectors, which were revolved to produce a flashing characteristic. In 1902 a new third-order lens was installed and in 1917 a red sector was added to alert mariners of dangerous shoals south of the tower in Nassau Sound. Other facts about the Amelia Island Lighthouse; there are sixty-nine granite steps leading up to the light. It is one of only two remaining Lighthouses in Florida designed by Winslow Lewis. It is the westernmost lighthouse on the east coast of the United States. Our meeting place for the weekend is the Atlantic Auditorium located at 2500 Atlantic Blvd. 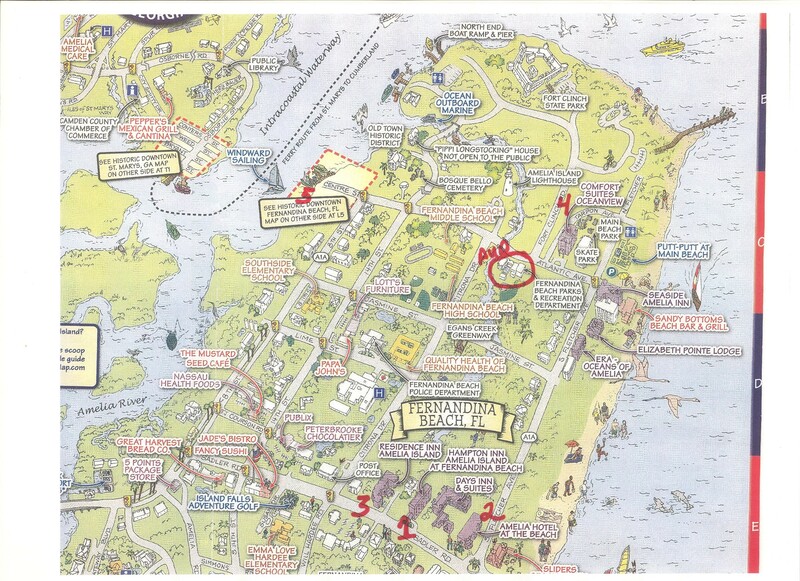 Fernandina Beach map. The event will start on Friday night with the FLA Board Meeting at 6:00 PM followed by the social hour. On Saturday our membership meeting will start at 9:00 AM with lunch at about 12:00 PM. From 1:00 PM to 4: 00 PM or until everyone has seen and climbed the lighthouse(,if they want to,) a 35 passenger bus will make round trips to the lighthouse, which is only about 5 minutes from the Auditorium. SINCE THE CITY IS REQUIRING FLA TO TAKE OUT INSURANCE TO CLIMB THE LIGHTHOUSE EVERYONE MUST BE A MEMBER OF FLA AND SIGN A WAIVER. Lunch will be Woody’s BBQ and will consist of Pulled Pork, Pulled Chicken, Sliced Turkey, BBQ Beans, Cole Slaw, Mac & Cheese, Tea, Water and Banana Pudding. We are still working on the Guest Speakers and will let everyone know when they have been determined. The cost for the event will be $55 for FLA members, $80 for non-member individuals and $90 for non-member family ($55 for spouse) and includes the Social event, the membership meeting, lunch, and transportation to / from the Lighthouse and for non-members a 1 year membership in FLA.
Other things to do in Fernandina Beach include visiting the Historic Downtown area, visiting nearby Fort Clinch State Park Fort Clinch where you can get a Great picture of the Lighthouse. The first three hotels listed are close to the beach and about 2 miles south of the Atlantic Auditorium. The Comfort Inn is less than a ½ mile from the Auditorium and the last hotel is about 2 miles from the Auditorium in Historic Downtown Fernandina Beach. Cut-off Date – 23 December, 2013. Cut-off – 23 December 2013.